Screenshot via YouTube/SW Mo. Dems, CC logo by staff male Bobby Finger. The presidential election isn’t the only nightmare awaiting us in November. 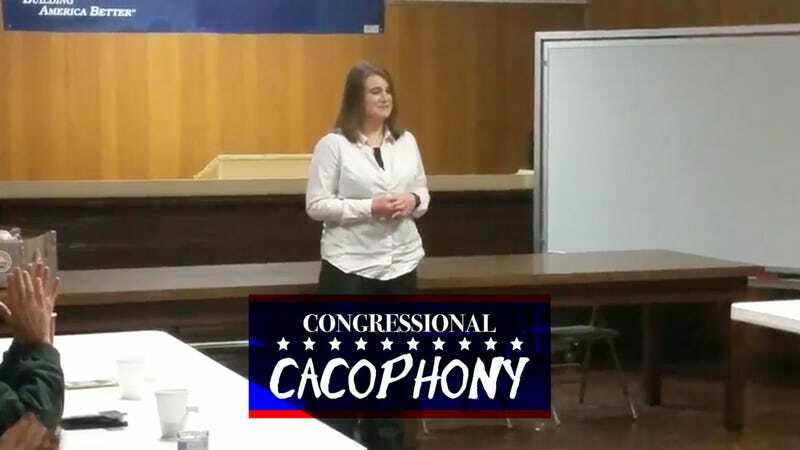 Welcome to Congressional Cacophony, a feature on The Slot about House and Senate races that really, really matter. Suggestions? Pitches? Email us. A 28-year-old woman running for Congress in Missouri is joyously, vigorously, thoroughly mocking her incumbent opponent for having an absurd four-day fundraiser in Vegas. Genevieve Williams is taking on Billy Long, who’s been in office since 2011 and is in the regular habit of holding strangely expensive fundraising rallies, including one at a Taylor Swift concert and one at a Jerry Seinfeld performance. Long’s campaign finance report also shows he spent nearly $7,000 on “event tickets” at Caesar’s Palace. Reding said those tickets are for a September fundraiser featuring a show by Jerry Seinfeld, among other things. He did not say how much Long expects to raise at the event. Overall, Long’s re-election committee burned through $173,000 from April through June — more than any other House member from Missouri and well over the $99,000 Long raised over the same period last year. In all, Long spent nearly $21,000 in campaign money in Las Vegas in 2015. They do say you have to spend money to make money, but that is... a lot of money. Then, in mid September, Long’s campaign announced that he would be returning to Vegas for a fundraiser that included a stay at the Wynn Las Vegas and a chance to go see Celine Dion. Long paid a consulting firm $28,000 to put his fundraising party together. This is the definition of a longshot campaign: Long began his run with $700,000 and Williams, according to her campaign, just this month raised the $5,000 minimum that requires a candidate to start reporting expenses to the FEC. But watching someone so thoroughly troll an incumbent is pretty damn satisfying on its own.